What can modern genetics tell us about our past, present and future? Is our destiny written in our genes? And if so, how can we read them? Genomics has hit a tipping point. Today a full genome sequence laying out your six billion DNA building blocks will set you back $10,000 and can be completed in a few months. Companies are now on the march towards reducing the costs to under $1,000. Walgreens, America’s largest drugstore chain, has begun to offer genetic tests to the masses. Within the next decade, all newborns will have their genome mapped and deciphered as a matter of routine. 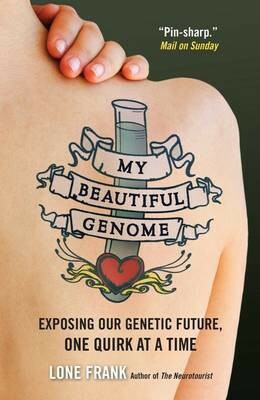 In My Beautiful Genome, the internationally acclaimed science writer Lone Frank adopts the mantle of an intrepid consumer to look at how this revolution is changing the way in which we view ourselves and live our lives. The possibilities of early detection and prevention of disease are tantalizing, she points out, as are the prospects for personalized drug treatment. Even characteristics such as personality and temperament are being redefined as subtle variations in our chromosomes. From ancestry tracing and genome sequencing to breast-cancer scanning and personality profiling, Frank describes not only the science and the scientists behind the testing but also how it feels to be at the receiving end of all this genetic information – as both consumer and research subject. Drawing on candid interviews and commentary and adding just a touch of self help, she aims to provide the first truly popular account of what this shiny new science means for the average punter. Laconic, witty and irreverent, My Beautiful Genome is set to be the essential sightseer’s guide to our newly revealed genetic terrain.